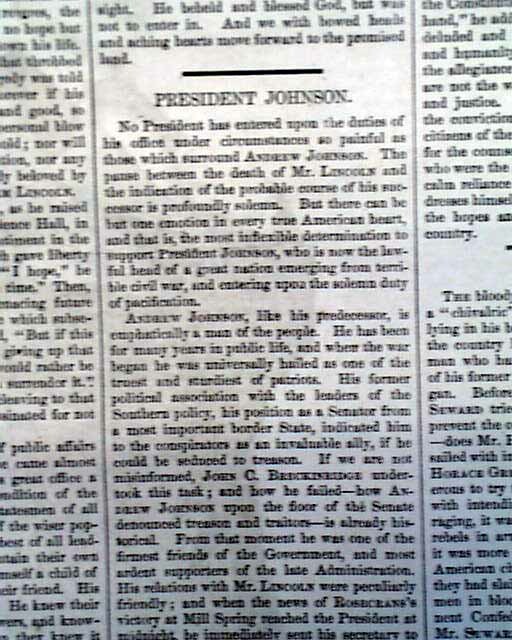 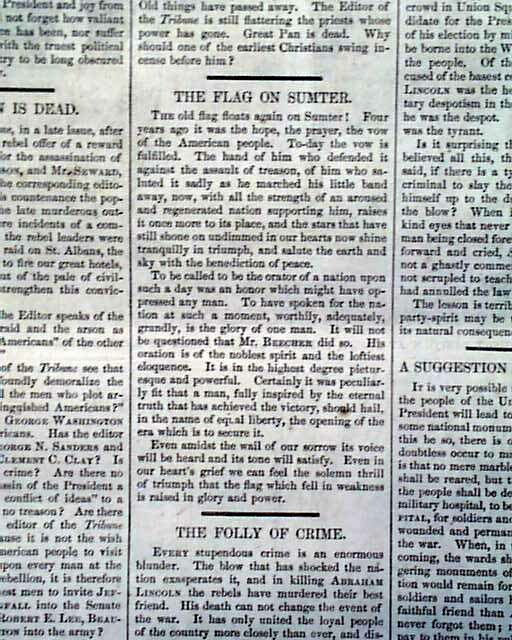 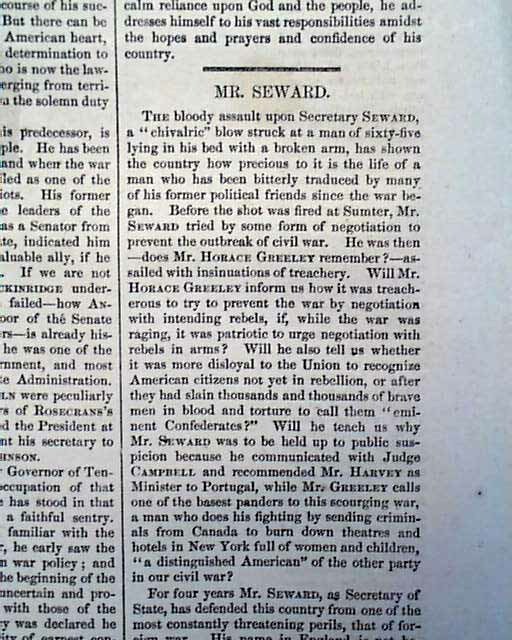 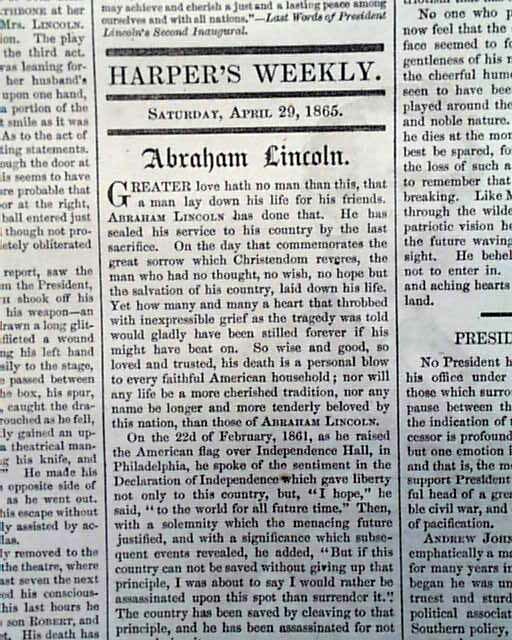 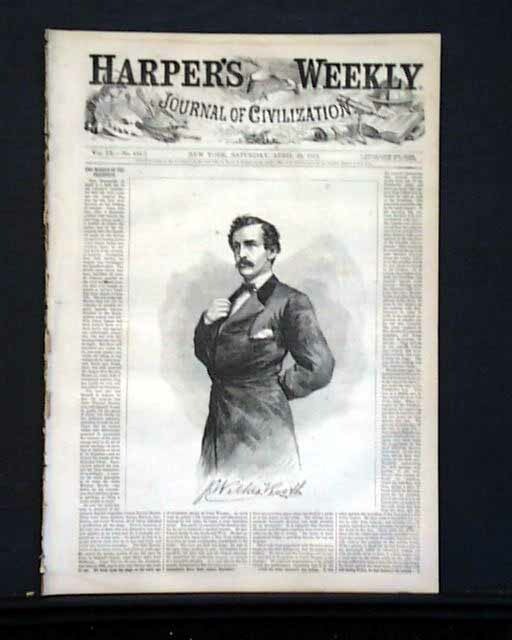 Inside text articles are entitled "Abraham Lincoln", "President Johnson", "Mr. Seward", "Great Pan Is Dead" and "The Folly of Crime". 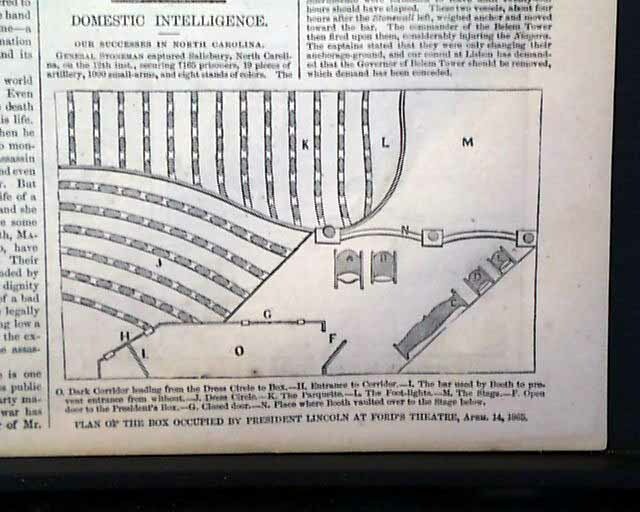 A small illustration captioned: "Plan of the Box Occupied by President Lincoln at Ford's Theatre, April 14, 1865" is shown also. 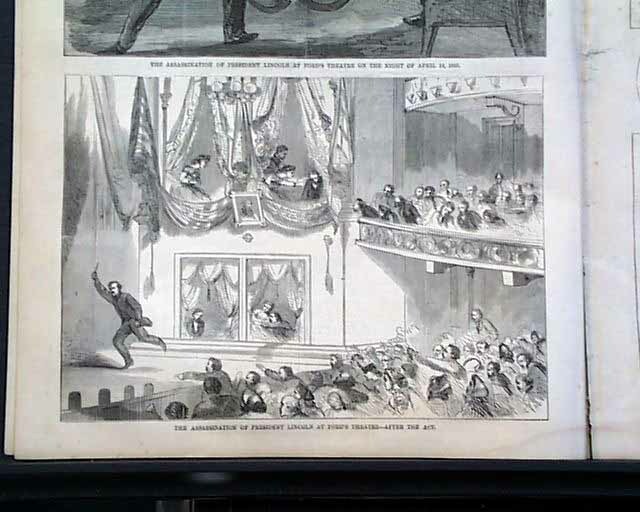 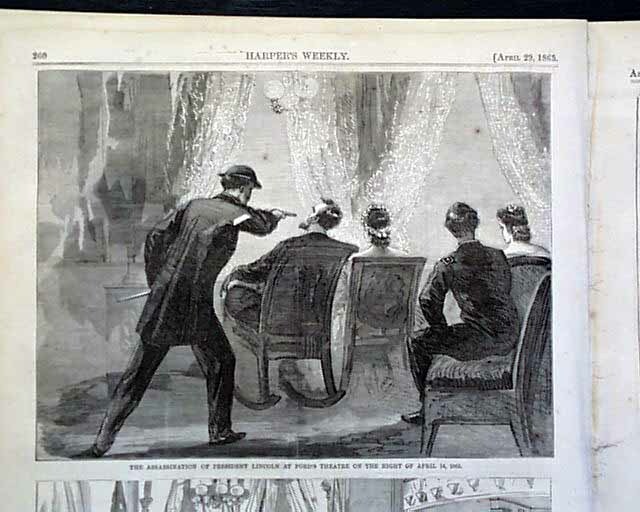 Also inside is a full page with two prints: "The Assassination Of President Lincoln at Ford's Theatre on the Night of April 14, 1865", one showing Booth shooting Lincoln in the head, and the other: "The Assassination of President Lincoln at Ford's Theatre - After the Act" showing Booth leaping to the stage in making his escape. 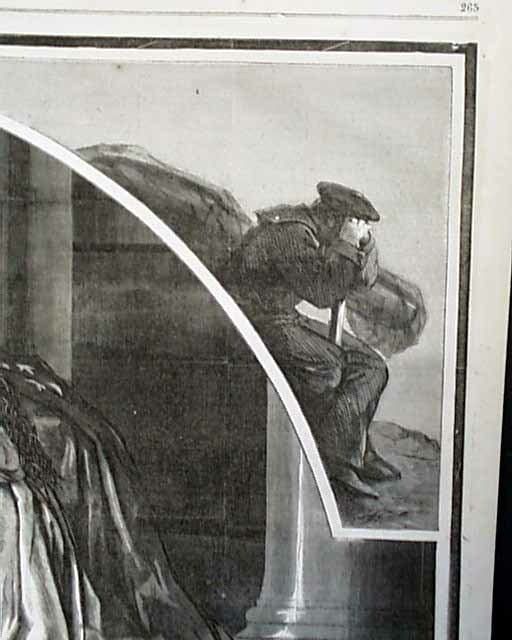 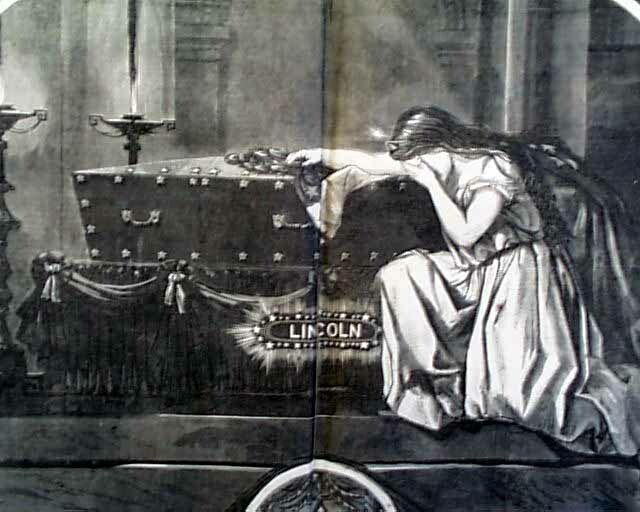 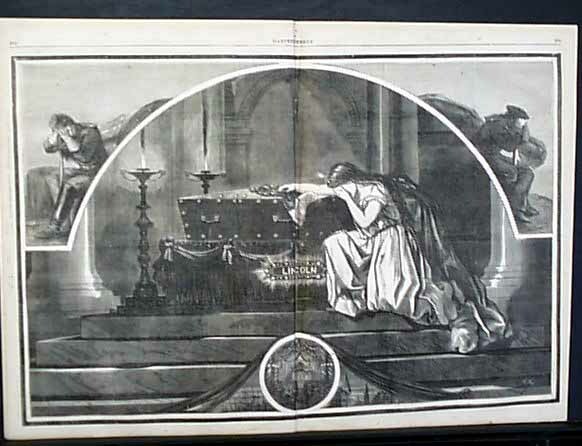 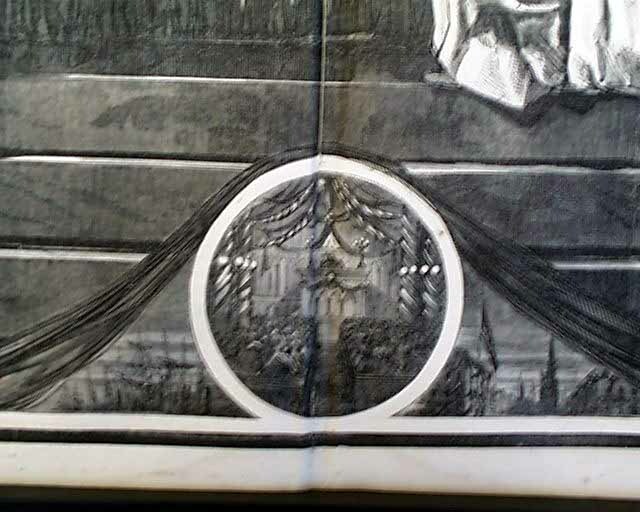 The very dramatic doublepage centerfold by Thomas Nast shows Liberty weeping on Lincoln's coffin. 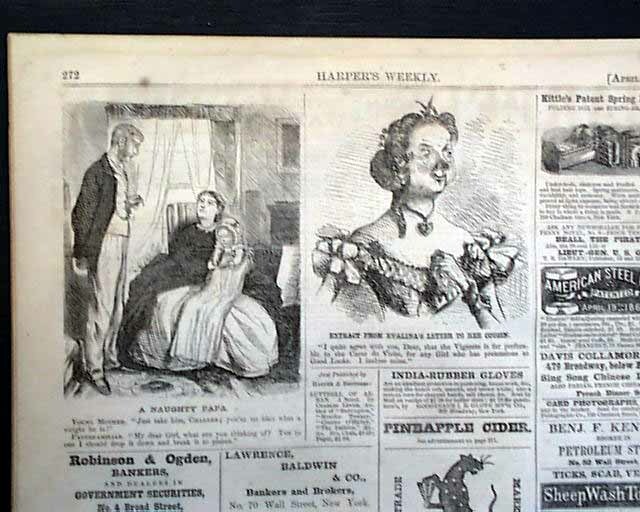 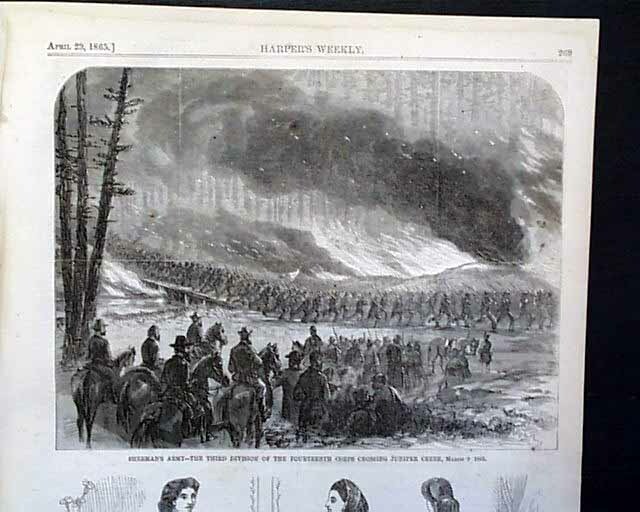 A full page engraving by Thomas Nast shows: "The Eve of War" and "The Dawn of Peace" with a related article. 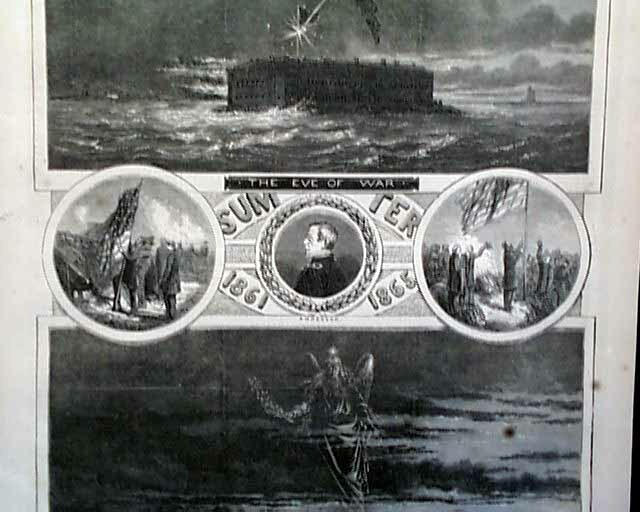 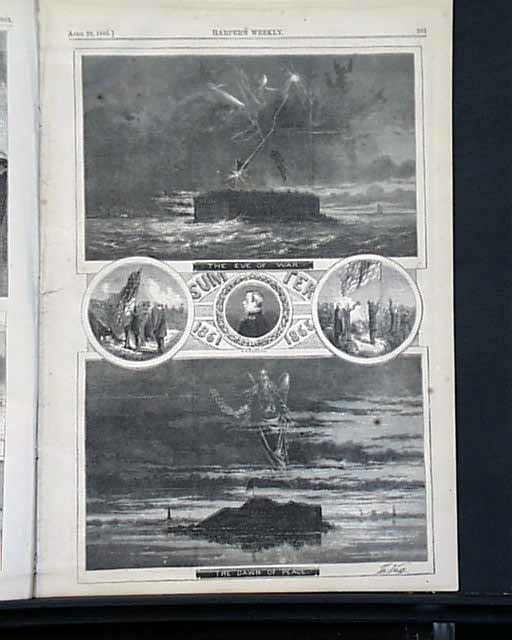 Another page features a 1/3 illustration: "The Siege of Mobile - Wreck of the 'Osage' and the Monitor 'Milwaukee'", 1/3 page illustration: "Landing of the National Forces at the Mouth of Fish River, Below Mobile, March 23, 24, and 28th, 1865"; 1/6 page illustration: "Destruction of the Tin-Clad No. 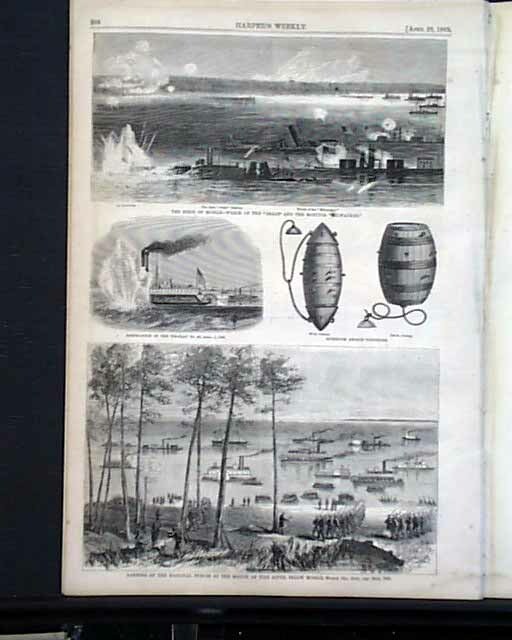 48, April 1, 1865" and 1/6 page illustration: "Mushroom Anchor Torpedoes". 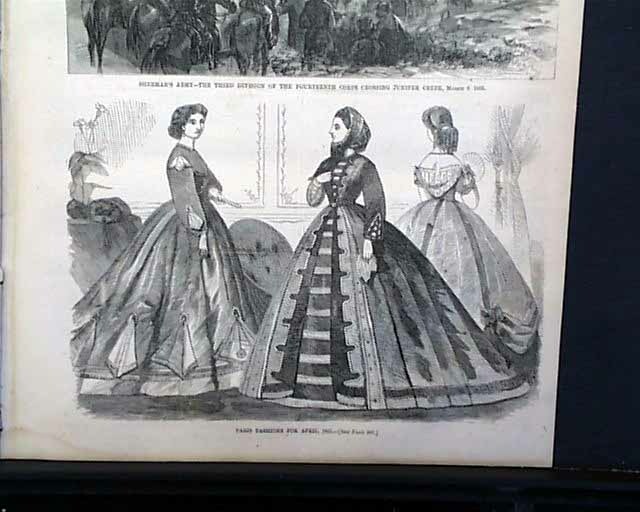 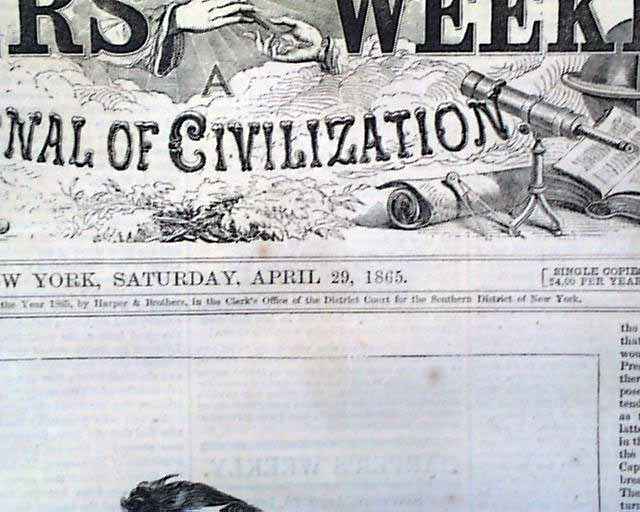 Also included is a half-page illustration of the "Paris Fashions for April, 1865" and a half-page "Sherman's Army - the Third Division of the Fourteenth Corps Crossing Juniper Creek, March 9, 1865".